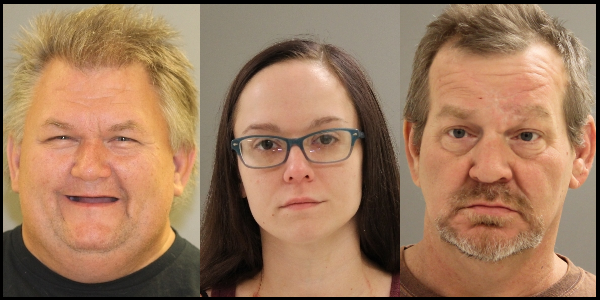 Two men and a woman from Pontiac are under arrest and facing drug charges. Late last week, the Pontiac Narcotics Unit executed a search warrant for an apartment in the 900 block of West Madison Street. The warrant led to the arrest of 56-year old Thomas Emerson Jr. who faces a charge for unlawful delivery of a controlled substance. During the search authorities seized 89 Norco pills and a 2004 Dodge Caravan. A second search warrant was given for a residence in the 1000 block of East Water Street. 51-year old Michael Price and 27-year old Karley Jo Runyon were arrested. Price faces charges for unlawful delivery of a controlled substance and possession of a controlled substance. Runyon faces charges for possession of a controlled substance and possession of a hypodermic syringe. Police were able to find several jeweler bags of suspected heroin, syringes, drug paraphernalia and a 2002 Mercury Villager. The incidents remain under investigation. The Dwight Drug Unit, the Livingston County Pro-Active Unit, Pontiac Patrol, and the Livingston County State’s Attorney’s office assisted in the arrests.